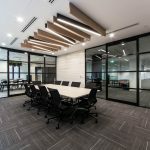 Parmelia House at 118 St Georges Terrace is home to “Flux”, an exciting co-working space where businesses can work, collaborate and network in an innovative and flexible environment. IA Design were engaged to construct this innovative office environment, spanning 1,400m2 across the three floors including the basement, ground and level 1. The intent of the fitout was to deliver a series of spaces that would enhance and promote collaboration amongst Spacecubed’s members. The client brief called for Flux to present an industrial warehouse feel with a hospitality type appearance and experience, not a traditional office. The fitout was to appeal to a younger demographic who are educated, technology savvy, well-travelled, cultural and ethnically diverse. The various floors have been transformed from a basement bar and traditional office space into an exciting and innovative working environment with a contemporary industrial warehouse feel. This was achieved by exposing the natural skin and surfaces of the building and the introduction of finishes and fittings which added detail and character to this amplify this aesthetic. Budget and environmental considerations resulted in the introduction of recycled furniture and minimised use of building materials. The finished palette included galvanised steel, chipboard, axon cladding, OSB, plywood, painted exposed slab ceilings and services, timber studded rubber and concrete flooring and columns finished with Savon Noir. All possible opportunities for value engineering were thoroughly investigated. This iconic fitout successfully facilitated the growth of Parmelia House as a leading CBD tenancy option, and has since has been named “Perth’s ground-breaking space in the CBD… set to change the way we work”.